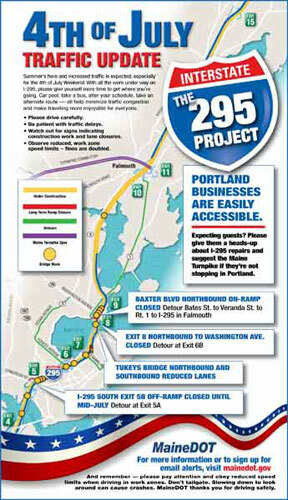 In 2009, the last time that Maine decided to do major highway and bridge repairs on Interstate 295, someone created a Facebook page called "I Hate I-295 (Maine)." It's hard to keep up with road repair in Maine. So much of the work is weather dependent, the summer working season is so short, and it's also the time when the roadways cater to Maine's number-one industry: Tourism. 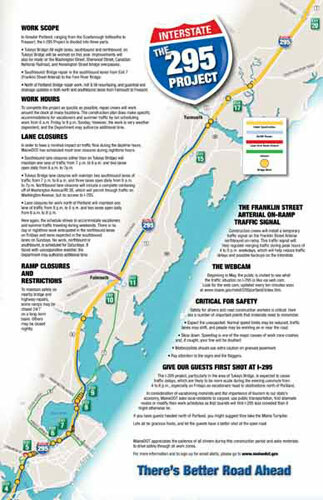 This time around, the Maine Department of Transportation asked us to unveil the plan for 2011's major facelift for I-295 from the Scarborough tollbooths to Brunswick and keep a vigilant public relations watch for the duration. 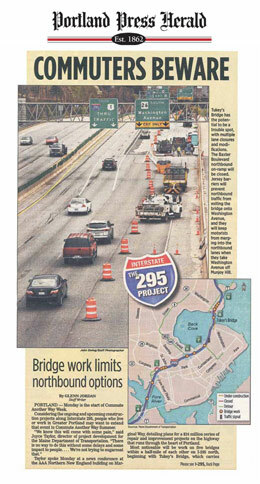 Lane closures, detours, closed on-ramps and off-ramps, reduced speed zones, flashing signs, orange signs, orange barrels everywhere the "I-295 Project" had great potential to be a nasty mess. We started off by connecting lead engineers and state and local officials with Portland's print and broadcast media with a detailed press conference held overlooking the highway. An entertaining radio campaign alerted drivers ‹ particularly the vacationing motorist ‹ throughout the summer. 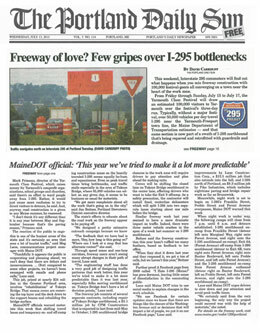 Weekly media advisories kept MaineDOT's professionalism and diligence squarely in the press's perspective. We must admit, though, that the pre-planning done by all of the engineers and construction crews made the public relations challenge easier than it could have been. There we're some brief tie-ups and a few inconveniences, but all told, the people out doing the real work on I-295 made us all look good. As the Portland Daily Sun reported, "The state's efforts to educate about the road work on the freeway appear to be paying off. A Facebook page from 2009 called ŒI Hate I-295 (Maine)' has gone dormant, leaving little sense of dissatisfaction in the commuting public."